In this expansion for the prize-winning Carcassonne, we move into the realm of fantasy. 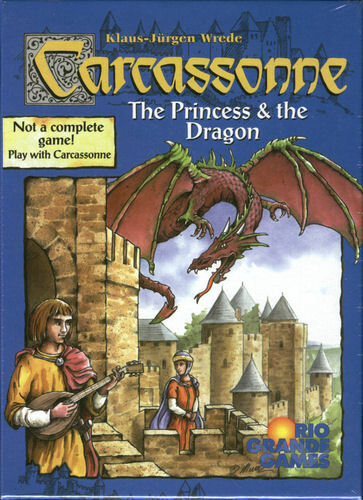 The land around Carcassonne is being visited by a dragon, making life very difficult for the followers. Brave heroes venture forth to face the danger, but without the aid of the fairies, their chances are not good. In the city, the princess seeks help from the knights, and farmers build secret passages to move about undetected by the dragon. We hope you enjoy this special trip into the land of Carcassonne! A good expansion that adds an element of semi-controlled chaos with the dragon rampaging around the board, knocking meeples off their tiles. The Princess adds a way to get more points (but the best part is the dragon). This game adds a lot of attacking of other players, kicking them out of the castle or sending the dragon to eat all their meeples. A great addition, but can cause a little loud heated conversations. Definitely my favorite expansion. This one calls for all out attacks on your opponents. The dragon rampages about the land, eating up meeples and allowing you to take out your opponent from that valuable field he's holding onto. This princess (which only appears in cities) allows you to remove your opponent's knight from a city. The fairy offers some protection from the dragon and gives you a few points here and there, but your opponent can easily take it away at critical moments. A great expansion adding in lots of new elements that can make or break your game.